December 27 is a day of immense grief and national tragedy because it was, three years ago to this day, when Pakistan in particular and the world in general lost a leader of high stature in the person of Mohtarma Benazir Bhutto. It also conveys the message in no uncertain terms that even in her martyrdom Shaheed Benazir Bhutto continues to be the symbol of the federation of Pakistan that she was in her life. Shaheed Benazir Bhutto’s life is a classic study of courage, commitment towards people’s welfare, and steel-like determination to accomplish the goals she set for herself. She took over the mantle of leadership of the Pakistan People’s Party from her illustrious father Shaheed Zulfikar Ali Bhutto in the most trying circumstances. She then carried forward his mission and braved the oppression of a dictatorial regime for eleven years with utmost courage. She continued to inspire millions and kept their hopes alive during this dictatorship. It is the sole honour of the PPP that it has its roots in every section of society – be they workers, labourers, peasants, students, lawyers, teachers, intellectuals and women. 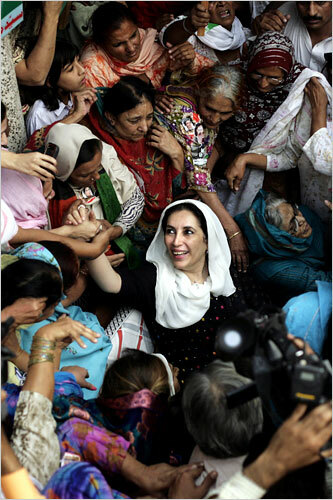 Due to her political wisdom and leadership, Shaheed Benazir Bhutto made her mark in the world politics. She was an embodiment of courage and endurance who did not allow her personal tragedies to stand in the way of her larger commitment towards her people.